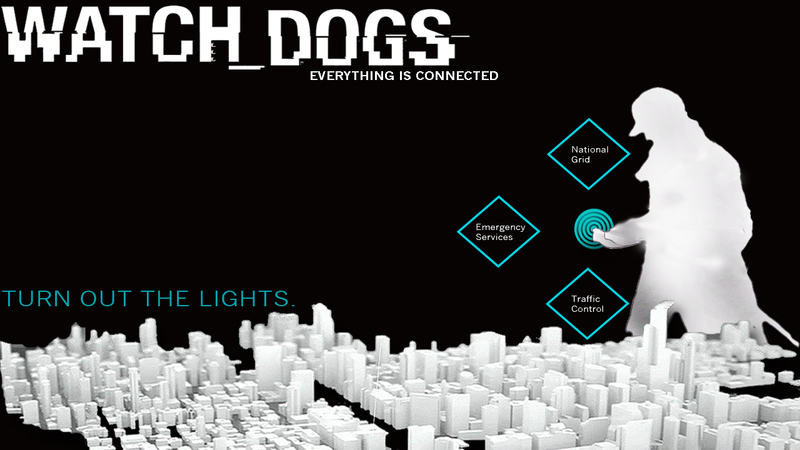 Have you seen the game trailers for Watch Dogs? 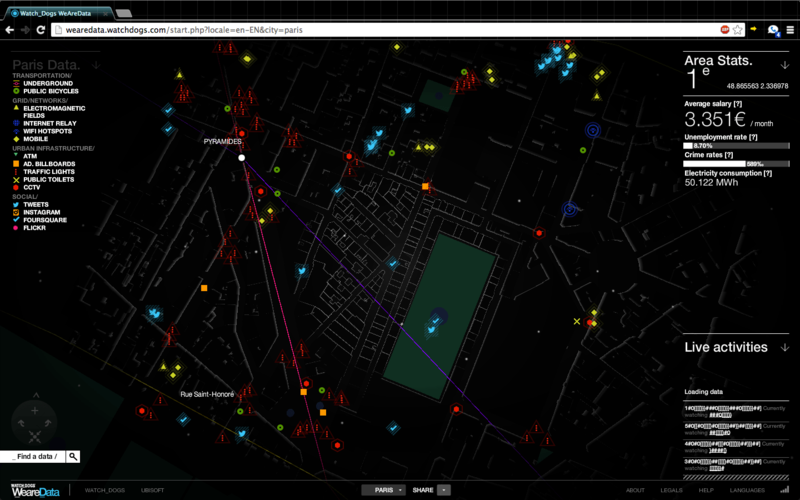 In the game, the player is a cyber-vigilante that explores a connected ‘smart’ city and accesses its 2D and 3D information like a high tech Batman. As an example of this, the game even has a website called We Are Data that shows real geo-located information about Paris, Berlin, and London from social media sites and public government datasets. The game seems like a glimpse into a distant future but believe it or not, we have the technology to make this notion of a ‘smart’ city happen now. Unfortunately the building industry is currently very change-resistant and far behind almost every other industry in adopting new technologies, despite the fact that it has potentially the most to gain from interactive data visualization technologies and the Internet of Things. The technologies also already exist to model our buildings and communities in extremely high levels of detail, including fabrication-level data that is both extremely accurate and ideal for efficient fabrication of buildings components and large assemblies. This same data can then be used by almost everyone to manage the facility and enable interaction with the occupants, both locally and remotely. The lack of change is therefore not primarily a technology problem (and the technology is getting better at an accelerating rate) but rather entrenched change resistance and silo thinking among architects, engineers, fabricators, builders, real estate developers and owners. Sure there is a growing use of 3D by both the geospatial and building communities, but the idea of intelligent interactive 3D cities seems more far fetched than a vacuum tube that shoots people from La to SF in 35 minutes. Using advanced technologies, we can collaboratively design, manufacture and construct innovative and high-performance buildings far less expensively and faster than by using conventional processes; but legal concerns, mindsets, domain wars and stubborn change-resistance is holding the industry back and delaying the inevitable democratization of the built environment through open digitization and automation. This has to change! Imagine using an Oculus Rift to walk through a building to see proposed design changes and its surrounding area, accessing building data via a Google Glass to assist with onsite construction, controlling the systems of a building touch free with haptic devices like LEAP Motion, or having intelligent building systems that interact with occupants via wearables and mobile devices. All of this is possible now, but who is going to build it? We need a group of cutting edge designers, builders, coders and other change agents that are looking to disrupt the current status quo. The biggest hurtle is really mindset. But this is not like the issues faced when web 2.0 was proposed, HMD’s for gaming, driver-less cars, even smart watches. Yet here we are. So to combat this, we have to hack it. The goal of this event that will be held at Facebook’s campus, is to try to kick start the imagination of people in and out of the AEC community to realize there is a lot we can do with the tools we have now. Imagine using a 3D printer to print out a new facet. Why not? Pipe broken, print a new one. Want to add that extra room to the house? Call your local prefab house builder, send them your house’s digital files and everything is created exactly to fit your existing. Want some new wall art? Put on a Google Glass like device and load up some designs. The computer already knows about your building so it can match up anything you want to see. We are starting to see small starts in our smart buildings. You can buy systems that allow you to turn lights on and off, change the temperature, smart fire alarms, and a few other small things from your mobile phone, but this is barley the tip. If we can connect smart people with the right data, there is far more we can do. Hopefully over the next few AEC hackathons, we will see a few hints of that future. And who knows? It’s possible something very cool, very fundable will come right from the event. Perhaps something the next version of Watch Dogs will incorporate as we build beyond what even the game proposes for our future.